Over a decade ago when I was a smaller companies analyst in the City, UK engineering company Fenner was part of the portfolio of stocks that I researched. I also got to know the company and its management team reasonably well when I gave up being a stockbroker and went to work for a fund manager which subsequently became one of the largest shareholders in the business. I have spent a good few hours talking with the current chief executive, Mark Abrahams, and have accompanied him around a few of the company’s manufacturing plants in the UK. Fenner is a business that I hold in very high regard. This is not just for the kind of products that it makes but also for the way it is run. As well as striving to make excellent products, my experience was that it had an excellent approach to serving its customers and promoted a decent working culture amongst its employees. Despite these admirable characteristics, Fenner has to work with some quite difficult assets. Both its Conveyor Belts and Advanced Engineered Products (AEP) are world leaders in what they do. However, many of their products are sold to cyclical commodities companies and sales are mostly made in foreign currencies. This has meant that the company’s profits and its share price have been very volatile. 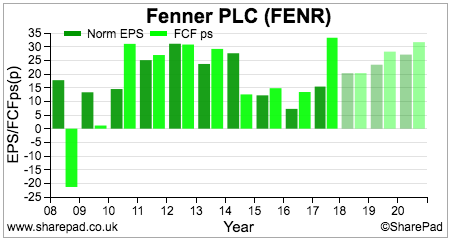 At the moment, both seem to be in a strong upwards trend but can the good times last? Let’s take a closer look at Fenner’s two businesses. Most of its conveyor belts are sold to mining companies. It has therefore located manufacturing plants close to key end markets in Australia and North America. It also has plants in the UK, Holland, India, China and South Africa. Its conveyor belts will also be found in places such as ports where they are used by bulk handling facilities and at coal-fired power stations. The vast majority of the sales are for replacement belts. This means that it is a consumable item from its customers’ point of view. Demand for belts is therefore highly dependent on the levels of mining production which in turn is influenced by commodity prices. 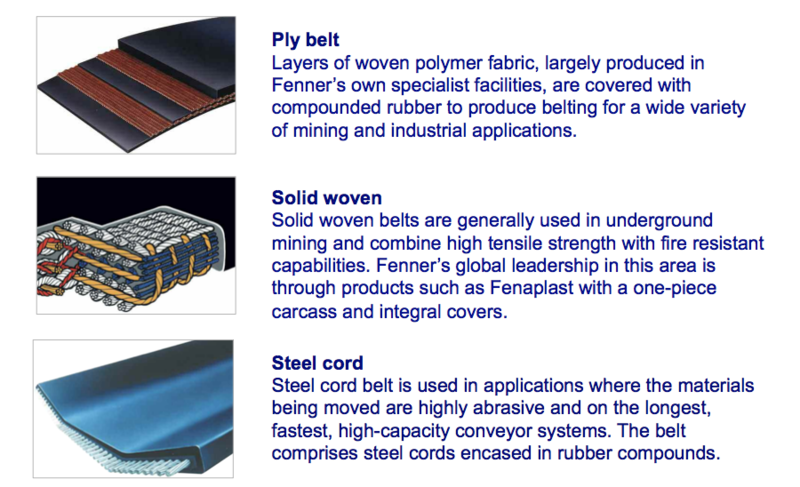 Fenner also has a service business for its customers’ belts. This business has experienced some very difficult times in recent years which has seen its sales and profits decimated since peaking in 2012. The US coal industry has come under severe pressure from cheap gas prices and the growth of the shale gas industry. There has also been severe price competition across markets. Fenner has always competed on quality rather than price. Its selling proposition to customers is on the lowest total cost of operation from using its belts. Its belts may be more expensive than some of its rivals’ but because they are more durable and last longer it avoids the time delays and cost of stopping production involved with changing cheaper belts more frequently. This makes them better value. This message has struggled to carry a lot of weight in recent years but according to the company there are signs that this is changing. Other good news is that destocking of belts in the Australian market may also be coming to an end although the Chinese market is a bit subdued. 2017 has seen a sharp pickup in sales and profits. As you can see from the table above, this is a business where profits and sales can see large swings upwards and downwards. This is due to high operational gearing on the fixed costs of the manufacturing plants. 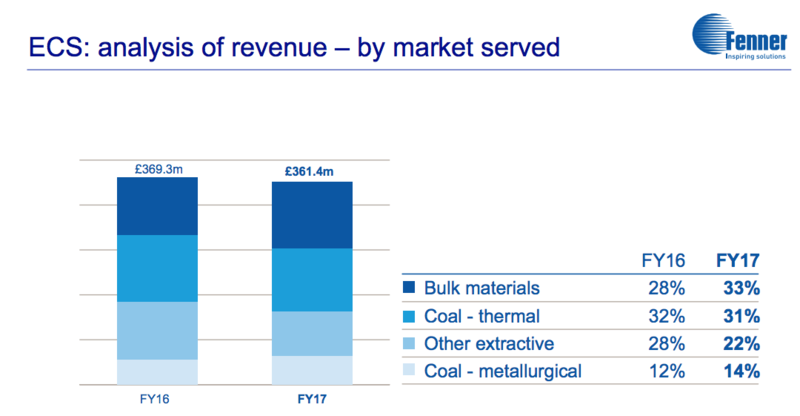 With the coal price at a recent high, it would not surprise me if this operational gearing leads to upgrades in profit forecasts from Fenner’s conveyor belt business as mining production remains relatively robust. The end of destocking and a moderating of price competition is also helpful for sales and margins. Longer term there are good grounds for being bearish on coal as a fuel source. That said, China and India show little signs of weaning their economies’ reliance off it for electricity. In the US the outlook is more sobering as utilities are shifting away from coal to gas and renewables. Fenner’s management team have been trying to diversify the company away from the conveyor belt business for a long time now. It has spent a lot of time and money in building up its Advanced Engineered Products (AEP) business which is now the company’s dominant source of profits and future long-term growth potential. They solve problems for customers. Represent a small outlay for the customer. Produce high profit margins for Fenner. The end markets for these products are shown below. Seals – High-integrity seals sold into the oil and gas industry as well as construction and mining sectors where hydraulic machinery is used. These seals minimise the risk of operational failures or contamination and therefore help to improve safety and minimise production downtime. Precision Polymers – Plastic and textile products such as belts for printers and hoses used on diesel vehicles, in agriculture and in the fracturing process in oil and gas exploration. Medical – Products used in heart surgery, orthopaedics, cell therapy and blood treatments. Fenner has a good track record at bringing new products to market using its own intellectual property but has also spent money buying companies that meet its product criteria. 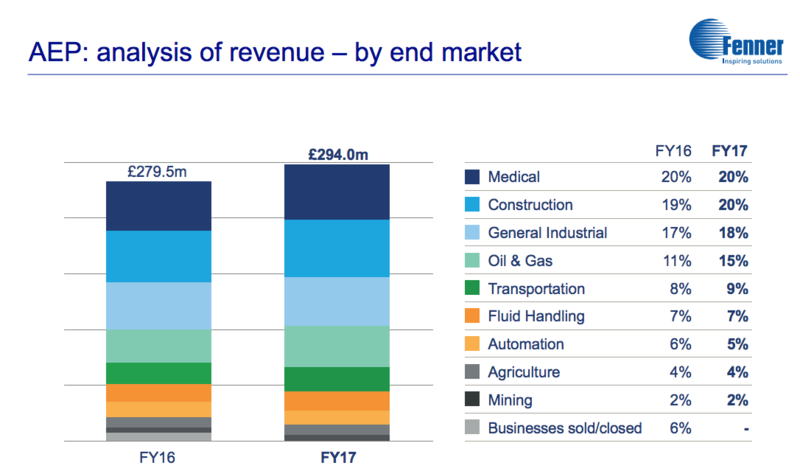 I do question whether the money spent on acquisitions has been well spent as AEP’s profits, whilst growing strongly in 2017 are little changed from five years ago. I am also concerned that the Seals business is also exposed to oil and gas prices and actually adds to the cyclicality of Fenner’s profits. However, the Medical business is earmarked for growth with the company targeting £100m of sales within the next 3-4 years from organic growth. This could be a significant driver of improvements in profit margins and ROCE. I do like this AEP business and its focus on niche, problem-solving products. There is scope to leverage the existing cost base of the business with new products and growing sales. My nagging doubt is whether it is just too niche to deliver sustainable and strong growth in profits and cash flows. I might be wrong, but I can’t help feeling that you need a lot of products selling well at the same time for this business to really hit a sweet spot. As with conveyor belts, there is a fair amount of operational gearing in this business. Oil and gas businesses are recovering and rig counts are growing. That should be good news for sales of seals and hoses. The Medical business also looks to have strong sales momentum at the moment. This leaves me thinking that this division could also be a source of more profit forecast upgrades. 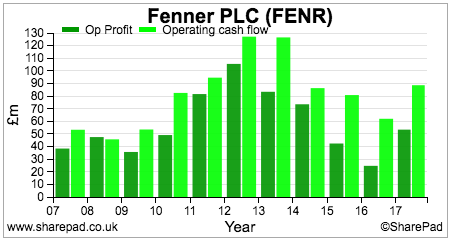 ROCE is on a short-term rising trend but is not stellar by any means and like profits has been very volatile. Even when intangible assets are excluded, Fenner still has some way to go before I would say it is making very good financial returns for its investors. Cash conversion is good. The company consistently turns its operating profits into a larger amount of operating cash flow which is a good sign. Even better is that in recent years, free cash flow per share has been greater than earnings per share (EPS). According to SharePad forecasts, City analysts expect this trend to continue for the next three years out to 2020. Debt levels have been coming down quickly as evidenced by a falling net debt to EBITDA ratio. SharePad now gives analyst forecasts for this ratio. These are saying that Fenner will be ungeared by 2020. If this happens then it would represent a significant and positive reduction in the risk of the shares in my opinion. Momentum stock or long-term investment? 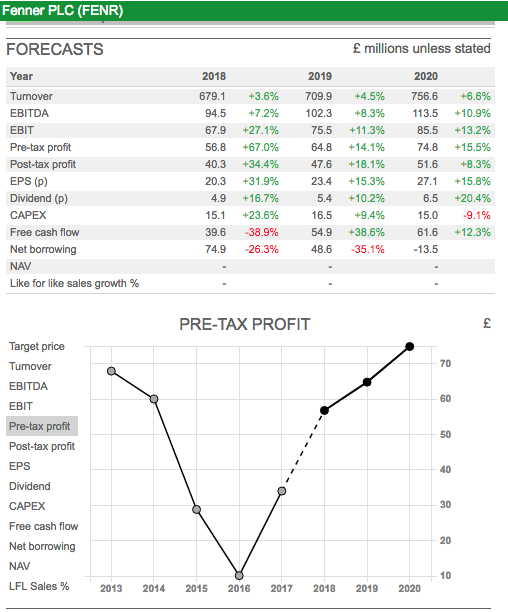 Fenner’s excellent share price performance over the last couple of years has been driven partly by a series of upgrades to profit forecasts. This has come from improving trading conditions and the inherent operational gearing of the business. 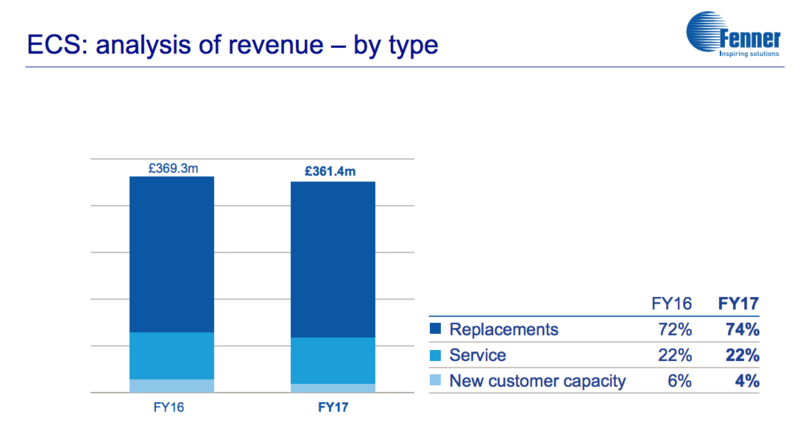 It’s only a guess but it would not surprise me if further profit upgrades come through from Fenner. The Conveyor belt profit cycle is probably not as strong as it was in the past but I see potential for profits to increase here. The same logic applies to the oil price and the effect it might have on the profits of the Seals business. As you can see, analysts are already predicting a fairly rosy outlook for profits. 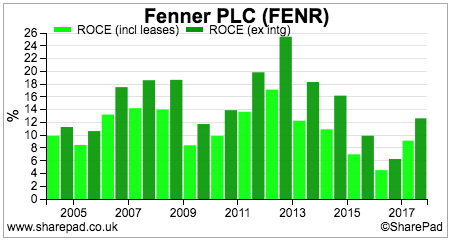 The shares are also quite highly valued on a one year forecast rolling PE of just over 18 times at 389p. However, the operational gearing is so big with this company that it won’t take much in the way of a trading improvement to feed through into more forecast upgrades. This could possibly lead to further share price upside in the short run. The problem with operational gearing is that it works in both upwards and downwards direction. Given Fenner’s still large exposure to commodity prices in both conveyor belting and AEP this would make me nervous owning the shares as a long-term investment at the current share price. For me, the non-cyclical parts of AEP such as medical are not yet big enough to offset the big risk of getting badly burned when commodity cycles turn downwards. 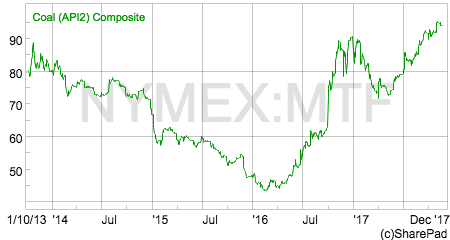 This leads me to view the shares as of more interest to traders than investors at the moment. This is a shame, as I think there is a lot to like about this company.